From the name itself, the house is shaped like a letter T. This T house has three zones following the T pattern where you can find the living room, the guest rooms and the kitchen with master bedroom upstairs. 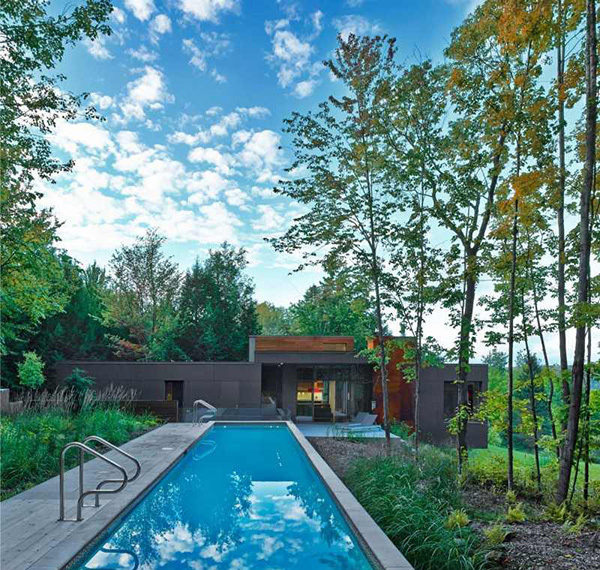 It is inspired from the writings of Pliny the Younger, that is why this villa is said to “stimulate the imagination and compel us to contemplate one’s place in the surrounding landscape.” This house is located in a forest clearing up on a hillside, in Quebec’s Eastern Townships. With that location, the family who owns this house could no doubt find a modern retreat in the country. 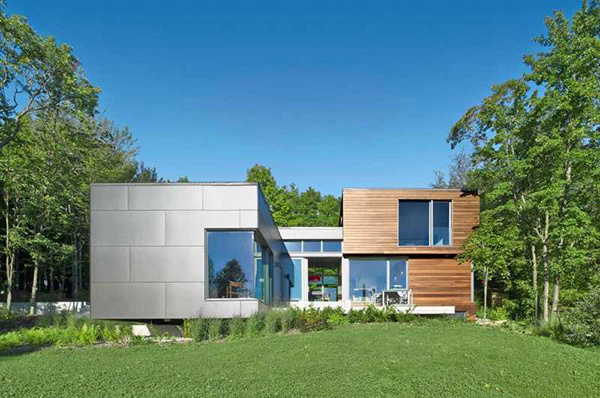 From this view of the house, you can see the different volumes in it although you won’t expect that it is actually shaped like a T.
Composite cement panels are clearly seen here which adds beauty to the home’s architecture. 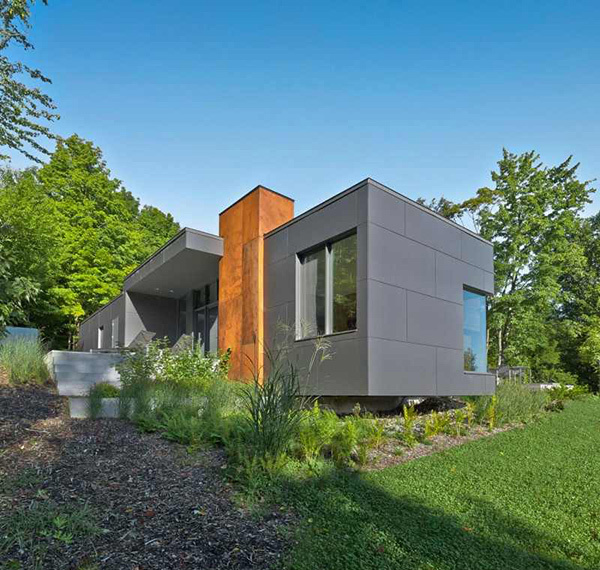 With the combination of materials in this house, it looked more modern and a sure charmer. 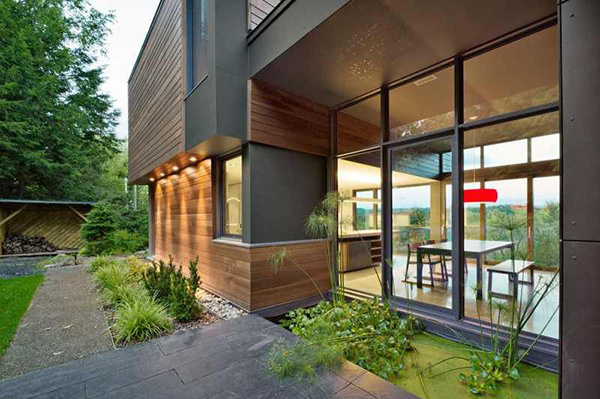 This side shows not just the exterior of the house but also how it is surrounded by natural beauty. 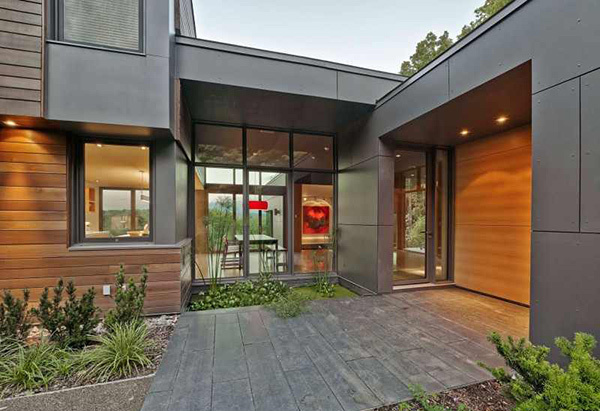 Glass is used for some walls and for the doors creating a more spacious interior. You can notice that this area used wood for the flooring. 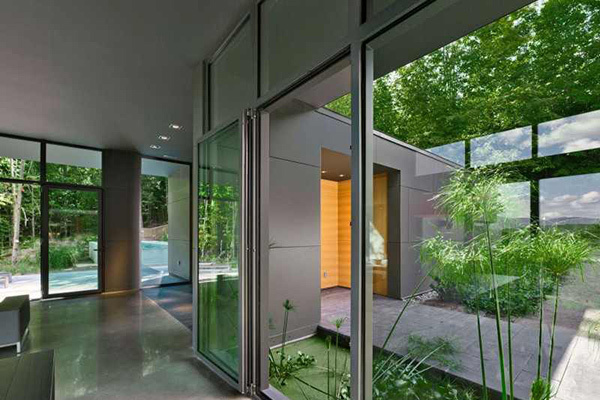 A glassed area that gives you a transparent view of the house, revealing its awesome interior. From inside, the outdoor view is clear with the use of glass. This space is indeed one lovely spot to stay in to get a good glimpse of the environment. It’s paved with stones that matched well with the composite cement panels. The interior of the house seems like an extension of nature in its use of wood. It also utilized minimal design while remaining gorgeous. We love how the shelf is seemingly embedded to the wall. That striped lounger is an eye-catcher! 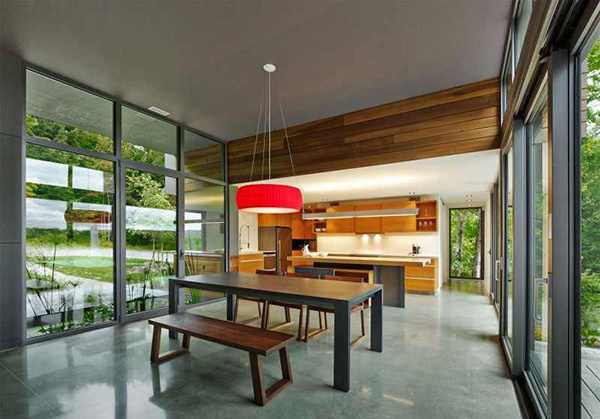 The red pendant light in this dining area is the focal point of the area breaking the monotony of colors in it. 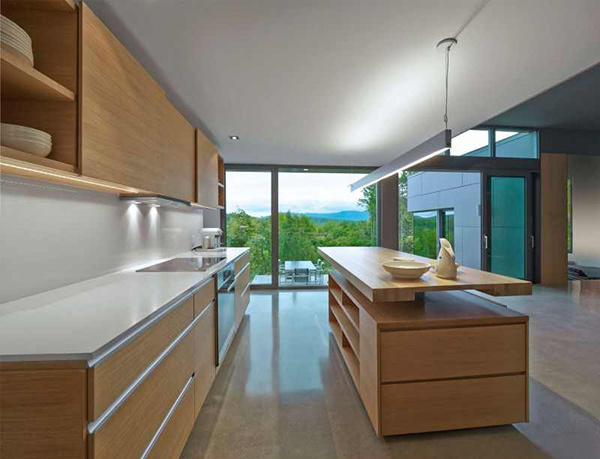 A clean and clutter-free kitchen with wood in it is a striking sight in the interior. This lap pool sits humbly in the yard while it gives off a beauty of its own from the blue-tiled flooring of the pool. 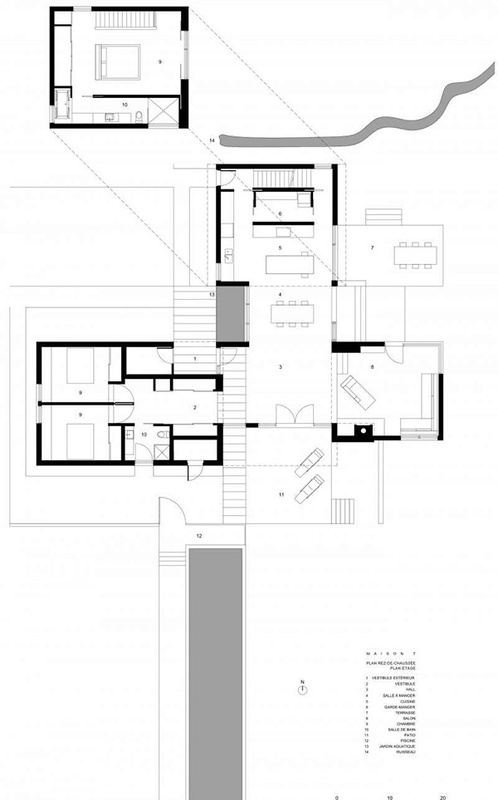 The floor plan of the house shows us the different areas in the interior and how well-distributed the functions are. 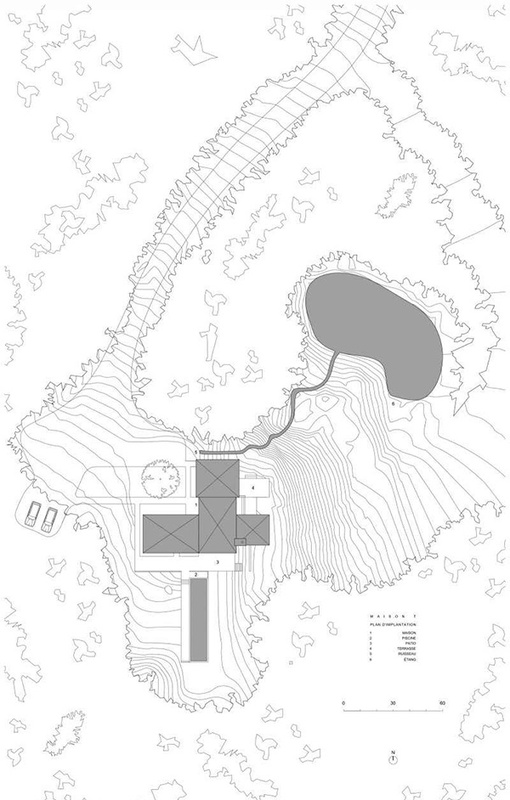 This sketch plan shows the location of the house and how it forms the letter T.
We love how this house was designed by Natalie Dionne Architecture who had that beautiful choice of materials. The volumes of the house were well-designed too that it created depth in view and also fitted well with the different areas of the house. 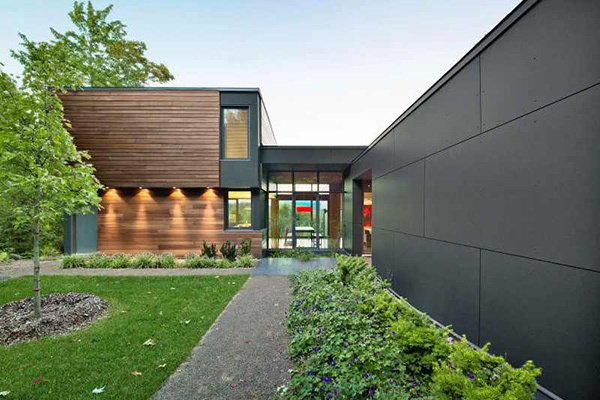 Aside from the stunning and imposing exterior, the interior also deserves applause. It has that relaxing interior using wood in most of the spaces. For sure, this house would end up in your list of favorites!